This Work Package includes all activities related to the project coordination and technical management, as well as administrative and financial management. Quality assurance and risk management are also handled by this WP. As a Coordination and Support Action (CSA), the project will organise and conduct surveys, workshops and seminars involving academia, standardisation and specifications organisations, public authorities, transport industry stakeholders, technology specialists, representative organisations of passengers such as the European Passengers’ Federation, and of the industry such as the European Rail Industry (UNIFE), Union Internationale des Chemins de Fer (UIC) and International Association of Public Transport (UITP). These activities will be organised in Work Packages specialising in the analysis of the Transport Services Market (WP2), of the Regulatory Framework (WP3), and of the Technology Market (WP4) for the specific technologies, in particular the semantic web technologies that will be incorporated in the design of the IF and of the TC. 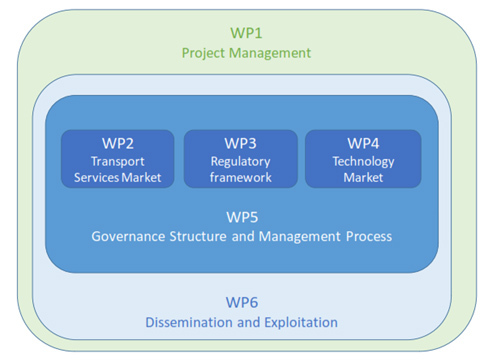 The governance and management structure will be the specific deliverable of WP5, and will be based on best practices as implemented by the W3C consortium governing the specifications and World Wide Web technologies. This work package has the responsibility to ensure that the project results & outputs are disseminated widely and effectively exploited by their target groups (including Shift2Rail).